From impulse purchases to that top that colour clashes (and not in a good way) with the rest of your wardrobe, we all have things taking up precious space in our closets and on our shelves. By donating to Oxfam, you’ll be freeing up space in your life and making a real difference to people affected by poverty. Discover why Sharon Corr decided to Make Space for Oxfam. Due the recession and the increase in commercial second-hand clothes dealers, some of our shops have seen donations drop by as much as 40% in recent times. We need your unwanted items more than ever to help fund our work tackling poverty and injustice in 93 countries. Whether you bought a size too small, a shade too dark, or splashed out on a whim, we all have clothes, CDs and homewares that we don’t use – so do yourself, and others, real good and Make Space for Oxfam! Simply drop your unwanted items into your local Oxfam shop or into your nearest donation bank. For less than the price of a donated top (€9), you could pay for a mosquito net to protect a family threatened by malaria, helping them to sleep safely and soundly at night. The sale of a vintage jacket (€15) could give a family in the Democratic Republic of Congo an eco-friendly efficient stove, designed to be hotter than traditional cooking methods while using only half the wood. For the price of a pair of bedside lamps (€17) you could give a family a hygiene kit with essentials such as soap, detergent, toothpaste and toothbrushes for use in the aftermath of disasters. 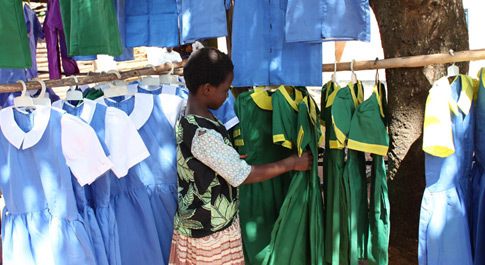 The money raised from five donated paperback books (€18) could open a new chapter in a child’s life, providing school books to a pupil in Tanzania for an entire year. A jumper, a jacket and a top donated together (€35) can be used to buy a vulnerable family a goat, providing milk that can be sold to pay for school fees and tools. The sale of an armchair (€60) could help to support an amazing grandmother looking after grandchildren who have lost their parents to Aids, helping to keep them in school and providing access to essential medicines. HOW CAN MY COMPANY MAKE SPACE FOR OXFAM?